Big earthquakes appear to follow a brief episode of "shallow mantle creep" and "seismic swarms," according to new research at Oregon State University. KOIN 6 News reports that the study was published Monday in Nature Geoscience and offers an explanation for the foreshocks obeserved prior to large quakes. The findings, according to the study, are an important step toward understanding the relationship and intersections between aseismic slip and seimic slip. Aseismic slip — also known as a silent or slow slip — is a displacement along a fault that occurs without notable earthquake activity. Researchers focused on the Blanco Transform Fault off the Oregon coast for the study. A transform fault is a plate boundary at which the motion is mainly horizontal. Under the sea, transform faults connect offset mid-ocean "spreading centers," which are places at seafloor ridges where new oceanic crust is formed through volcanic activity and gradually moves away from the ridge. "Slow slip directly triggers seismic slip — we can see that," said co-corresponding author Vaclav Kuna, a graduate student in geology and geophysics in OSU's College of Earth, Ocean and Atmospheric Sciences. "The findings are very interesting and may have some broader implications for understanding how these kinds of faults and maybe other kinds of faults work." For the study, researchers deployed 55 seismometers on the ocean bottom on and around the Blanco fault for a year. "It's a very seismically active fault that generates significant earthquakes at higher rates than the majority of faults on land, making it ideal for studying the process of earthquake generation," Kuna said. From September 2012 to October 2013, the seismometer deployment resulted in the detection of more than 1,600 earthquakes at the Blanco Ridge that the study monitored. According to the study, two distinct asperities along the ridge rupture about every 14 years with earthquakes in the magnituge six range. "Our work was enabled by recent advances in long-term ocean-bottom seismometer deployments and is only the second major project targeting an oceanic transform fault," said co-corresponding author John Nabelek, professor of geology and geophysics at OSU. At its southernmost point, the Blanco Transform Fault is about 100 miles from Cape Blanco — Oregon's westermost location. The fault runs northwest to a point about 300 miles from Newport. The Cascadia Subduction Zone lies between the Blanco fault and the coastline. The research also states that "the fault was the site of a magnitude 9 earthquake in 1700 and is building up stress where the Juan de Fuca Plate is sliding underneath the North American Plate." Some scientists predict that there's a 40 percent chance of another magnitude 9 or bigger earthquake happening along the fault in the next 50 years. "The Blanco fault is only 400 kilometers offshore," Nabelek said. "A slip on Blanco could actually trigger a Cascadia Subduction slip; it would have to be a big one, but a big Blanco quake could trigger a subduction zone slip." The research goes on to explain the boundary between the crust and the next layer — the upper mantle — known as the Moho. "We see slow, aseismic slips that occur at depth in the fault beneath the Moho and load the shallower part of fault," Nabelek said. "We can see a relationship between mantle slip and crust slip. The slip at depth most likely triggers the big earthquakes. The big ones are preceded by foreshocks associated with creep." 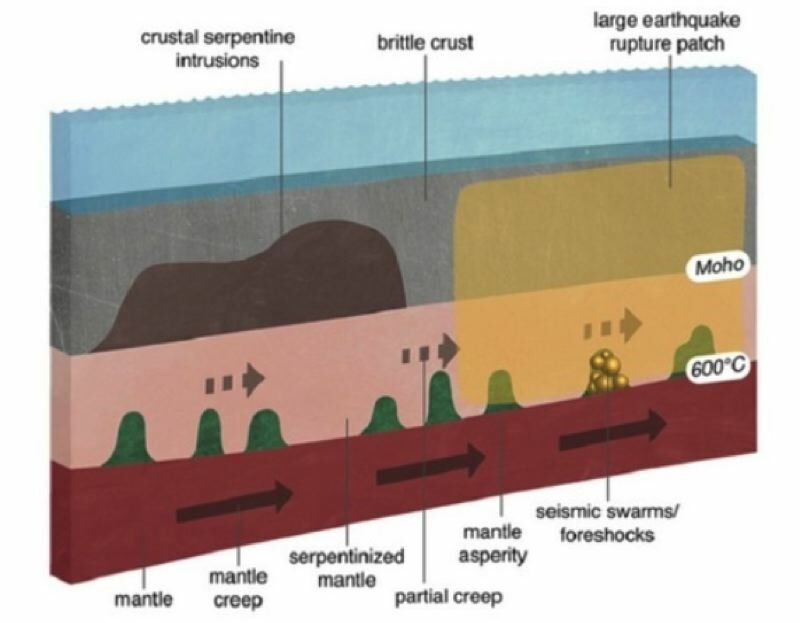 According to Kuna, the layers have different levels of seismic "coupling" — the ability of a fault to lock at asperities and accumulate stress. "The crust is fully coupled — all slip is released in a seismic way," Kuna said. "Fault in the shallow mantle is partly coupled, partly not, and releases slip both seismically and aseismically. The deep mantle is fully creeping, uncoupled, with no earthquakes. But the fault is loaded by this creep from beneath — it's all driven from beneath. Our results also show that an aseismic fault slip may trigger earthquakes directly, which may have implications for active faults on land."